Great design and looks elevate this curved phone, but performance is hindered by a software experience that is not fully hashed out. Flagship season is just around the corner, with less than a week to go for MWC 2015, but as is the nature of the Android smartphone market, we’ve seen some fantastic devices released already. While not the juggernaut for Android that MWC will be, a slew of impressive smartphones were launched at CES 2015, one of the most notable of which was from LG. After a fantastic 2014, LG started 2015 off with a bang, introducing the follow up to its, and the world’s, first curved display smartphone, the G Flex. While the original can be considered more experimental, its successor, at least on paper, is certainly more equipped for prime time. But is this device more than just defined by its curve? We find that out, and more, in this in-depth review of the LG G Flex 2! The design of the LG G Flex 2 focuses on one particular aspect, the curved screen, that might look and feel a little odd at first, but there are definitely some high points when it comes to this phone’s aesthetic. For starters, the screen itself has been brought down from the very large size of its predecessor to a more accessible 5.5-inches, putting it squarely in the territory of current flagship devices. There are no buttons on any of the sides, though the headphone jack and the microUSB charging port are found on the bottom. The button layout, instead, takes on the now iconic LG placement, on the back below the camera optics, with the volume rocker flanking the power button. Having the buttons here has already helped previous phones for LG, but the curve makes it feel even more natural, as index fingers easily rest on there. The curve on the screen makes the entire phone perch up a bit when lying on its face, but the point of this phone is that you can flex it flat without much fear of anything breaking. The back cover also has the self-healing material that is supposed to make superficial scratches fade over time, but the problem with this backing is that the sticky material is a real fingerprint magnet, and will collect dust quite easily because of its static cling. The back is also removable, giving access to the SIM and microSD card slots. The curve was already well received from an ergonomics standpoint in the original 6-inch G Flex, but with the smaller screen the handling is even better. Getting from side to side is easy with the small bezels, but the way the phone naturally sits in the hand makes hand gymnastics easier to perform. Though this red edition might be a little too flashy for my tastes, I can’t deny that the brushed look adds to what is a really attractive device all around, and if you are worried about the curve being hard to fit in a pocket, it fits nice and comfortably in all but the tightest of jeans, so it’s not really an issue. A 5.5-inch screen on the G Flex 2 brings a higher resolution than before, the quality standard of 1080p in this IPS screen. The brightness is quite great even in broad daylight, and the curve does make the experience a little bit more immersive. Colors do tend to have an adequate saturation to them and this can be adjusted further in the settings, but keeping things 1080p keeps sharpness constant compared to the oversmoothing that was present in the LG G3’s Quad HD screen. Seeing elements scroll along the curve is an effect that hasn’t gotten old, though in real usage it is so subtle that you won’t notice it all the time. But without the phone being so close to your eyes, the immersive experience is something I’m convinced is only true for huge, high resolution televisions, and doesn’t really translate to this smaller display. An in-house coated screen claims to have even more protection available compared to Gorilla Glass, but thankfully there was a screen protector already installed because I found a scratch on the top right of it after just a few days of usage. All said and done, I’ve had a very good time with the LG G Flex 2 screen, enjoying media on a screen large enough to do so, but also for handling all other tasks like text reading and navigation. One of the surprises at the announcement was the processing package found within, with the LG G Flex 2 being one of the first widely available phones to rock the Qualcomm Snapdragon 810, backed by an Adreno 430 GPU and up to 3GB of RAM. Everyone was expecting the performance to be off the charts, and for the most part, playing games and performing just about any in-app task is an absolute breeze. Even working with the Dual Window functionality works quite well, with my typical combination of Youtube and Chrome working well enough for me to work and play comfortably. It’s also worth mentioning that issues with overheating were not observed in my testing, and while the phone did get a bit hot, I never noticed any slowdowns, and certainly no shutoffs, due to overheating. Where I see the problems is in the operating system, the latest iteration of Android with LG’s G UI on top, with the results being uneven at best. 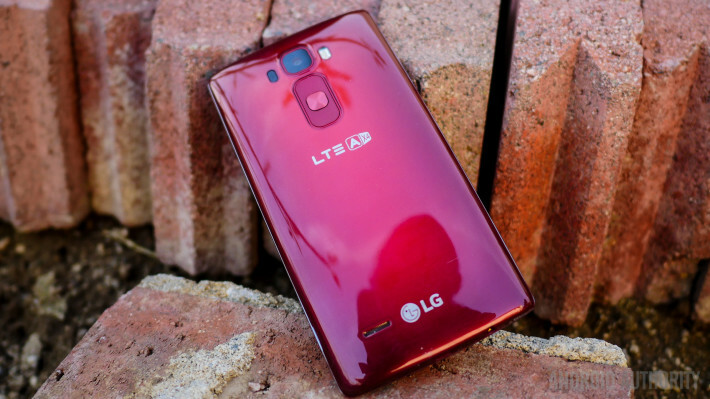 Where the LG G Flex 2 was supposed to be a showcase of the Snapdragon 810, we get a choppy experience in even the most basic of tasks within the G UI. Multitasking will have a routine stutter, and even when scrolling through various elements like the homescreen customization screens, I noticed a lack of smoothness that many of us probably didn’t expect with this next generation processor. I even went so far as to install the Google Now Launcher to see if things would change, and sure enough, I thought that the animations in it moved along a little smoother, and I definitely preferred that experience over the G UI. Granted, this review unit came chock full of bloatware that is typically installed on Asian handsets, so the experience with a western release may be a little different. Hardware on the G Flex 2 brings the essentials and not too much more, but that’s not a bad thing. Removing the back cover gets you access to the microSD card slot, which allows for expansion of the 16 GB or 32 GB of on-board storage, which also determines how much RAM you get. Not surprisingly, the curved battery is not replaceable though. All of the connectivity options are available, including NFC and Bluetooth, though this Korean review unit didn’t connect to LTE networks on T-Mobile. Call quality was pretty standard, getting adequately loud on the receiving end, along with no complaints on the other side. The rear facing speaker is about as standard as you can get, though the upward curve on the bottom portion does keep it from getting stifled by the table it’s sitting on. When it comes to battery, the G Flex 2 packs a 3,000 mAh unit. During my time with the G Flex 2 over the last week, the battery lasted through full days of work with few problems, getting down to power critical levels before bed time. With power usage, that involved taking a lot of pictures and playing quite a bit of GTA Chinatown Wars, the device managed just over 3 and a half hours of screen on time, which is pretty good, considering that with lowered usage you should be able to go pretty far. The battery life isn’t groundbreaking, but keeping the screen down to conventional resolution levels seems to have evened out the longevity when compared to its high resolution brethren,namely the LG G3. Though the camera experience has gotten a bit of an update, in mostly speed, quality seems to be on par with other high-end competitors. The app is quite simplistic, taking on a minimal interface that requires you to only tap the point of focus and once focused, you get your shot. This is due to the laser-guided autofocus that makes this one of the fastest cameras to use in the market today. Unless you have a subject running around in the frame, you’ll get your picture in seconds with little issue. Other modes include a burst mode that is triggered by holding the shutter down, panorama, a dual shooting mode that uses both cameras in the same shot, and HDR, that does enhance backlit subjects and adds a little bit of color to photos. The biggest update to the camera experience centers around the self-portrait taker, who will be able to use the 2.1 megapixel front facing camera to quickly and easily review the shot by moving the phone downward in a natural curve. The picture will automatically appear when the phone detects this movement, making self portrait shots pretty easy to check out immediately, and delete if necessary. Picture quality, though, is pretty uneven, and quite dependent on the lighting in one’s scene. In the camera shootout, I found that while there were good shots captured in broad daylight, going indoors already showed a big change in the detail capture and color saturation, with subjects that are supposed to have very vivid colors getting washed out. As the scene loses lighting, the pictures get noisier, making this a less than ideal companion to have in lower light, or even in indoor situations like at parties. Despite OIS+ helping with the general jittery movements in photo and video, it and the laser guided autofocus are about all that differentiates this camera from others, considering its otherwise mostly standard quality. As mentioned before, it’s the software on this phone that seems to result in the performance issues with the G Flex 2. Even though it has been updated to Lollipop, it doesn’t seem as though the G UI has really been optimized to its fullest potential on the Snapdragon 810. That said, there have been a few changes to the way it works, because of Lollipop. The recent apps screen has been changed to a rolodex Lollipop style, and the notification dropdown now uses cards. But seeing the original style in the quick settings atop the notifications already alludes to the fact that the G UI is mostly still the same, inside and out. The app drawer has the same style, now very cluttered by the sheer amount of extra applications that were pre-installed on this version of my phone. The settings area is tabbed, and it houses the many different options that you can turn on to tweak the experience, when it comes to one handed usage, some gestures, and a section to mess with the Knock Code. Speaking of the Knock Code, it is still a pretty nice way of unlocking the phone from the prone position. The main enhancement here is the addition of quick peek, which can be activated on a turned off screen by dragging one’s finger down the screen to see the time and the notification bar. There are certainly some useful features here, but what is particularly disappointing is that without many changes to how the interface looks, we also didn’t get many changes in the optimization. As it stands, this version of the G UI simply isn’t the best showcase for what was supposed to be a super-powered processing package, and that is probably the biggest let down. Though the LG G Flex is on pre-order with Sprint in the US, we have yet to see where and at what price the phone will be available on other carriers in the West. The off-contract price on Sprint, for the moment, is listed at around $500. Though the LG G Flex has proven that curved displays can definitely work for flagship smartphones, the only competitor with a curved display thus far is Samsung with the Galaxy Note Edge, and whatever edged device we might see from them at the upcoming Mobile World Congress at Barcelona. So, there you have it – the LG G Flex 2! The updates to this phone’s design and faster camera experience are nice, but the day to day usage of this phone is too uneven to call it a true winner. While more localized versions of the phone will probably fare better, the G UI is a bit too cluttered for its own good, and doesn’t really show the performance that the processor is capable of. This is still one of my favorite form factors available now, with its much easier handling due to a smaller screen, and the curve that is not only different but proves its worth as a design choice. It will be going too far to say that this isn’t a worthy phone for daily usage, but without some real optimizations in the software, it’s clear to us that this phone goes a few steps forward, but loses footing in where it counts most.